Preparation of samples for alpha spectroscopy has always been a critical part of the analysis process. The problem rises from the fact that the interaction of the alpha particles with the massive parts of the sample under analysis reduces the energy with which the particles escape from the sample and reach the sensor and this produces a distorted spectrum with a long tail starting from the peak corresponding to the maximum energy (non-interacting particles) and goes towards gradually smaller energies. This, in the common case of the presence of multiple peaks, produces an overlap that makes difficult if not impossible the correct identification of the peaks produced by the different isotopes. In order to obtain a good resolution in energy, it is necessary to have sources in which the examined isotopes are present in the form of very thin films, deposited on a support. The methods for preparing the sources are all rather elaborate and complex and require good radio-chemical knowledge and quite complex equipment. But there are also simpler methods that, in some selected cases, still allow good results. For example, Polonium is selectively and efficiently adsorbed by silver, nickel or copper. 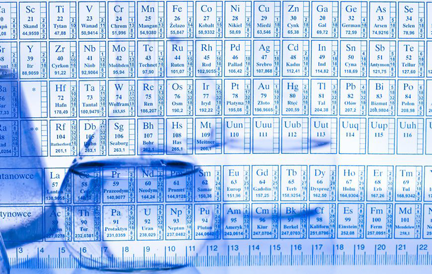 This chemical-physical property of Polonium can be exploited to obtain samples of the Polonium 210 isotope present in waters for which the degree of contamination by Polonium is to be evaluated. A similar method can be used for the evaluation of the quantity of uranium and radium present in aqueous solutions. In this case the selective properties of capture of these isotopes are exploited by the Manganese dioxide, in the case of the radio, and of a specific resin in the case of uranium. 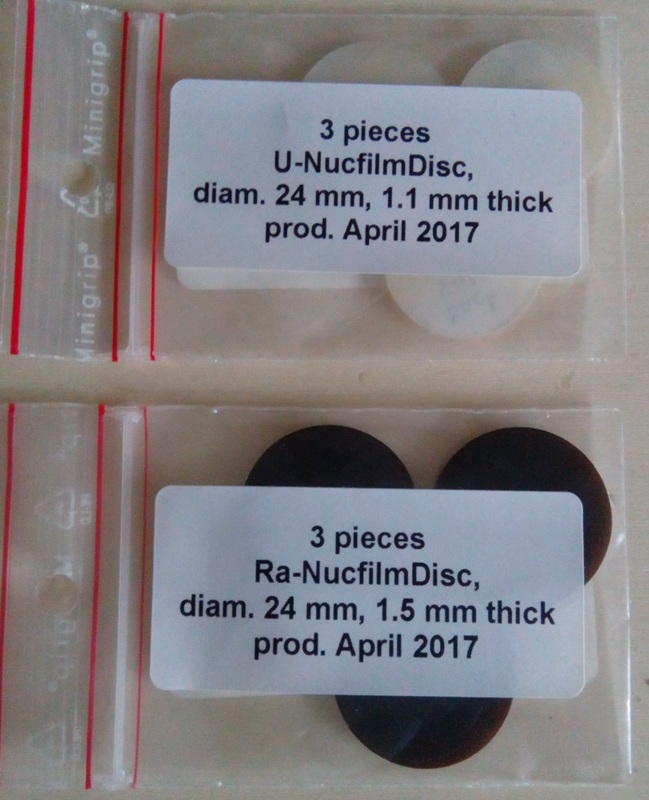 The image below shows the NucFilm diskettes (commercial product) for radium and uranium adsorption. 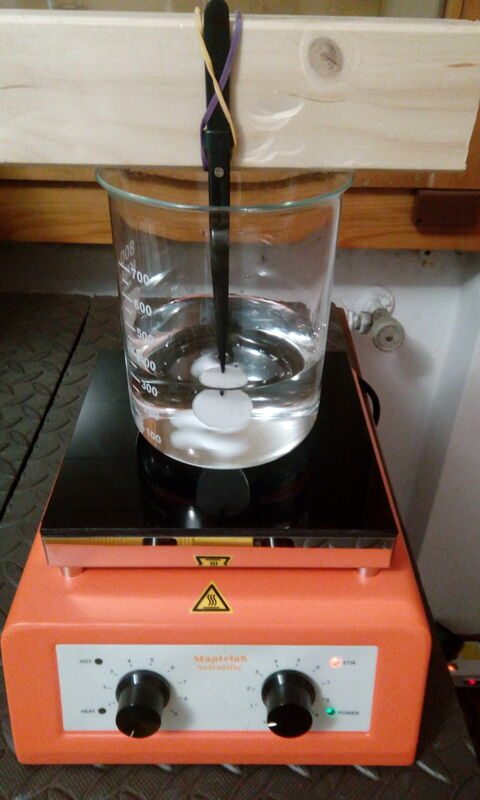 In the image below we see the magnetic stirrer with heating plate used in the procedure for the analysis of water samples. 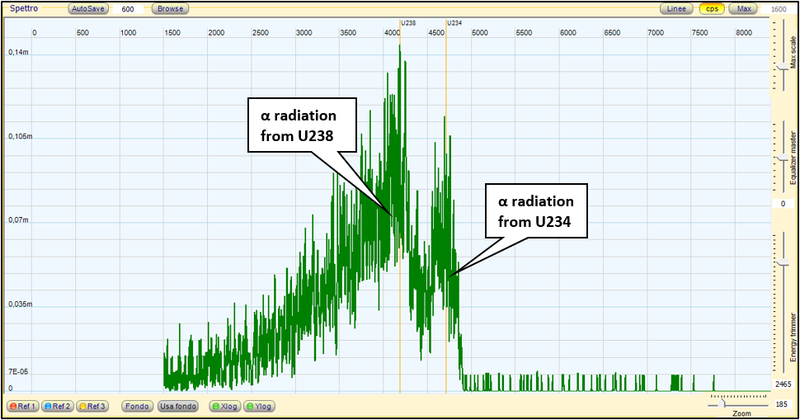 The graph below shows the alpha spectrum obtained by analyzing with the radio-sensitive disk a sample of water placed in contact with a source of natural radium (uranium ore). 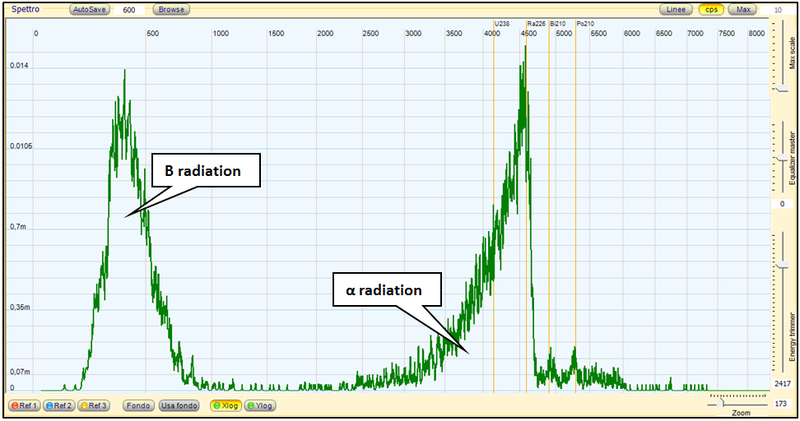 Note the pronounced peak at the radium 226 alpha emission. The concentration of the sample was relatively high and this produced a strong uptake by the disk. 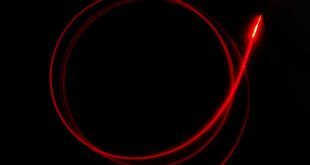 Under these conditions, the alpha source obtained is no longer made up of a thin superficial film because the isotope has penetrated deeper: this gives rise to a long tail with minor energies. 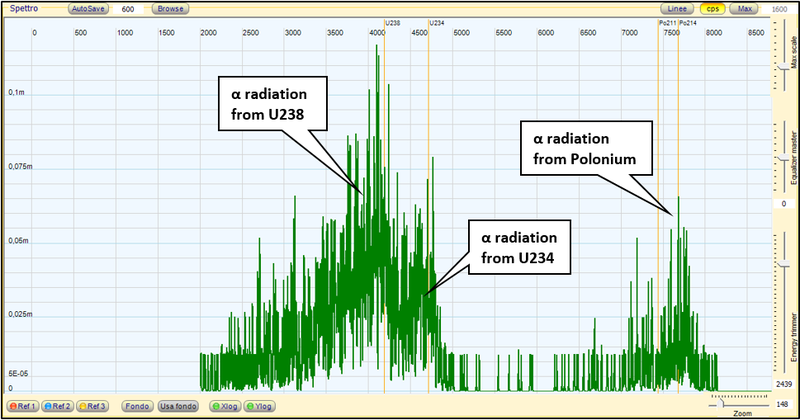 The graphs below show the alpha spectra obtained by analyzing with the Uranium-sensitive disc a sample of water placed in contact with an Uranium mineral sample . 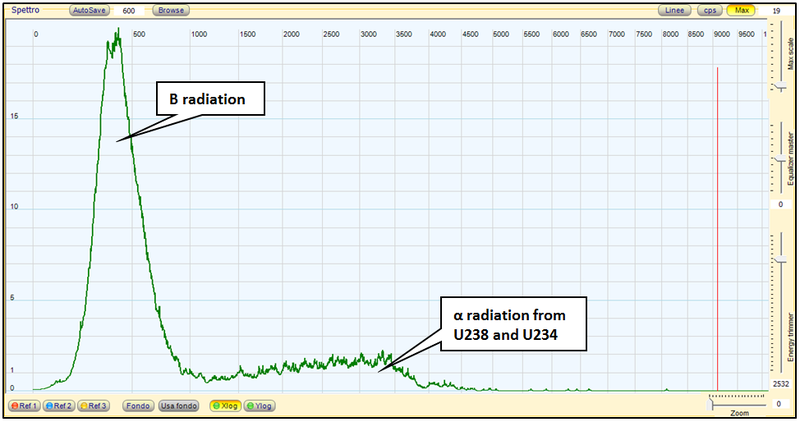 The pronounced peaks at the alpha emission of uranium 238 and uranium 234 are evident. The concentration of the sample was relatively high and this produced a strong uptake by the disk. Under these conditions, the alpha source obtained is no longer made up of a thin superficial film because the isotope has penetrated deeper: this gives rise to a long tail with minor energies. The first graph was obtained immediately after the extraction of the disk: in this spectrum appears also the contribution of the alpha decay of the polonium. In the second spectrum, taken a few days later, the contribution of the polonium disappeared due to the fact that it has completely decayed. This measurement technique is mainly used to carry out the analysis of water samples to evaluate the content in uranium and radium. The analyzes can be done both on samples taken at the source, and on samples of bottled water. We did a test on a commercial mineral water: the San Pellegrino. In the image on the side we see the sample used for the measurements and in the image below we see the alpha spectrum obtained after the measurement lasting over 24 h.
The result is interesting: we can see that the nucFilm disk has got a spectrum which shows an evident uranium content! Of course the levels of activity are absolutely low, I would say negligible, and the result should be interpreted only qualitatively. However, this makes us understand how the alpha spectroscopy method allows us to estimate and, if done with the necessary precision, quantitatively measure the content of isotopes in samples contaminated by microscopic quantities.